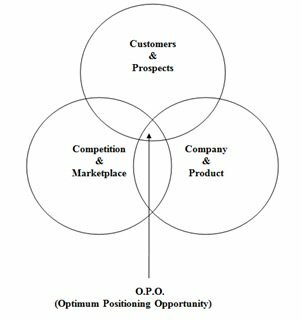 Every company has an Optimum Positioning Opportunity (O.P.O.). The opportunity for the company to claim a unique strategic position that they can own in the mind of their customers and prospects. It is the position that will differentiate you from your competitors and be compelling and appealing to the people you want to reach. It is the strategic position upon which you base your brand platform and therefore will influence all of your marketing communications, your company’s culture and organization. This discovery process leads to an area of overlap that addresses those points that enable you to identify that singular and unique promise that will differentiate you and motivate your customers and prospects. Every company has an O.P.O. Moreover, you do not have to be unique to own a relevant, unique and compelling position around which you can build your brand. A number of years ago a gasoline company claimed they were the gasoline with octane and positioned themselves as the gasoline with pep and will improve your car’s performance. What they did not say was that all gasoline has octane. Don’t settle for “me too” strategic positions that are neither differentiating nor compelling. Build your brand around a unique strategic position-your O.P.O.